Based on reviews from 71,769 users. Learn how our rankings work or see our guide to Adidas basketball sneakers. Updated Apr 2019. The athletic brand Adidas has been invested in the game of basketball since 1949. The sneaker model Trainingsstiefel is introduced as a multi-purpose footwear. It was intended to be used by the US Army and was the unofficial basketball sneakers during the early 50s. For protection purposes, the Trainingsstiefel is designed with a soft and cushioning sole, a rigid toe cap, heel counter, and pads on the ankle. Twenty years after the release of the Trainingsstiefel, the brand introduced the Adidas Supergrip. It was one of the first basketball sneakers that features a leather upper, instead of the conventional canvas material. The Supergrip is marketed as an athletic footwear that provides superior traction due to its vulcanized gum sole. While the Supergrip has been well-received by the consumers, a variation of it has become one of the most iconic sneakers in history. The Adidas Superstar is the most worn kicks in the NBA during the 70s. Due to its on-court popularity, it transitioned itself into one of the most recognizable street fashion gear that still stands today. Adidas made a business blunder during the 80s that changed the sneaker landscape forever. In 1984, a young rookie named Michael Jordan initially aspired to have an endorsement deal with the brand. Adidas refused, as it wanted to endorse center players instead. An upstart company, Nike, managed to sign Jordan and went on to catapult the Swoosh brand into undisputed sneaker hegemony that still stands up to this day. Below listed are some of the best-rated basketball sneakers from Adidas. Please be advised that the price and size availability of the shoes mentioned here may change at any point. One of the design details that stand out for the Adidas Cloudform Revival Mid is the seamless matte 3-Stripes on the lateral sides. Its upper consists of coarse woven mesh with a regular lace-up enclosure. This shoe provides ample comfort due to the cloudform dual layer sockliner and textile lining. The midsole and outsole also have the cloudform material that allows for superior cushioning. Also, there are rubber inserts on the outsole that offers additional traction. The regular price of the Adidas Cloudform Revival Mid is $85. It is available US men’s sizes, starting from 6 to 14. According to the wearers of this mid-top, its sizing is accurate. Core Black / Core Black / Onix and Grey / Tech Grey / Black are the color schemes available for this pair. Arguably the brand’s most popular street sneaker in its history, the Adidas Superstar OG’s design has been consistent. The iconic rounded toe shell gives a distinctly classic look but also offers extra protection. Hip-hop group DMC helped to make the Superstar one of the quintessential gear in street-style fashion by featuring it their song “My Adidas.” Although it was initially built to be used for playing hoops, it made more impact in the lifestyle category. The Adidas Superstar is a timeless shoe and continues to charm old and new wearers. This low-top’s regular price is $110. Regarded as a unisex shoe, it can be avail from US men’s sizes 4 to 14. Females need to subtract 1.5 from their regular size to get the desired fit. Some of the color options for the Adidas Superstar OG are White / Core Red / Off-White, Core Black / Trace Orange / Off White, and White / Green. The original Adidas Forum was introduced in the 80s, the decade which referred to as the “golden age” of basketball sneaker styles. This modern reiteration, the Adidas Forum Refined has retained most of the elements of its original version such as the x-shaped ankle strap, diagonal perforations on the lateral sides, and the debossed trefoil logo. However, flashy updates like the metallic silver overlay on its collar give a modern vibe on the classic silhouette. The mid-top Adidas Forum Refined has a regular price tag of $120. Men can avail this pair in US sizes, from 5 to 14. Plenty of the commenters attested that it runs true to size. The shoe provides ample breathability thanks to its full-grain leather upper and perforations on the toe box and sides. Cloud White / Cloud White / Silver Metallic and White / Collegiate Royal / Silver Met are some of the colorways available for this model. With more than 90% approval from its wearers, the Adidas Daily is, by all means, a bang for the buck. Its affordable price and fresh casual vibe are more than enough to consider it. Pairing it with jeans is ideal as it blends naturally. To simplify the description of the Adidas Daily, it doesn’t get any casual than this. Its regular price tag on the brand’s official site is $60. 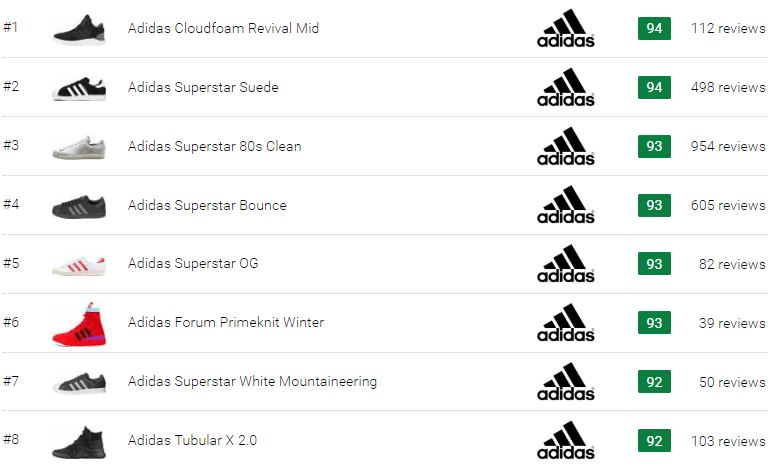 The Adidas Daily is offered in US men’s sizes, from 6 to 12. It also features a lightly padded collar to enhance the wearer’s freedom of movement. A few of the available color options for this low-top are Black / Black / Cloud White and Grey / Core Black / Cloud White. The Pro Model was introduced as a professional basketball footwear but made its transition to the streets during the 1970s. It is regarded as the high-top version of the Adidas Superstar. The classic design with superb ankle support has made the Pro Model one of the best lifestyle footwear the brand has to offer. This pair's full-grain leather upper gives the shoe a sleek and pristine vibe that works well with casual clothes. The regular price for this throwback high-top is $90. In US sizing, the Adidas Pro Model is offered from 7 to 14. Various reviews advised that it runs true to size. Tonal colorways such as Cloud White / Core Black / Cloud White and Core Black / Core Black / Core Black are available for this model. This reiteration of the classic Superstar is almost consistent with every element. But, as its name implies, the Adidas Superstar Boost features the brand’s most famous cushioning tech. Several of the wearers commented that it is superior to the original model because of the presence of this particular tech. Overall, the Superstar Boost is one of the Adidas men's basketball shoes because of its timeless style and support features. $120 is the regular price tag of the Adidas Superstar Boost. Similar with the majority of the Superstar shoes, this version runs true to size. It can be purchased in US men’s sizing, from 4-14. Sizes for women are also offered. Some examples of colorways for this high-top are Cloud White / Core Black / Cloud White and Haze Coral / Core Black / Off White. The Adidas Tubular Doom Sock Primeknit is one of the new Adidas basketball sneakers that belongs to the expanding Tubular series. Featuring one of the brand’s most prominent trademark upper material, this model’s flexibility, breathability, lightweight feel, and comfort pleased the majority of the wearers. This low-top exhibits a sock-like fit and an easy on and off wear. Also, the Tubular Doom outsole provides the necessary grip. Regular price for the Tubular Doom Sock Primeknit is $120 on Adidas’ official site. This Adidas basketball-inspired sneaker is available for both men and women in US sizes. Males can order from 7 to 13 while females can get theirs from 5 to 11. Core Black / Cloud White / Semi Frozen Yellow and Grey / Cloud White /Hi-Res Blue, so far are the only color options. Not much fanfare or history surrounds the Adidas Hoops 2.0 Mid. But, this model's style and features compensate for its lack of trivial information. Over 95% of its wearers are all about the positives, such as the impressive comfort, affordable price, versatility, and durability. The shoe has a synthetic nubuck as its upper with mesh collar and textile lining. Whether on and off the court, the Adidas Hoops 2.0 Mid got it covered. It has an affordable standard price of $65. The Adidas Hoops Mid 2.0 Mid is offered in US men’s and women’s sizes. Males could have it from 6.5 to 15 while females could have theirs from 5 to 15. Adequate ankle support is certain due to its mid-top construction. Modest color options such as Core Black / Core Black / Carbon and Cloud White / Core Black / Collegiate Navy are available for this off-court sneaker. Displaying a futuristic design, the sporty-looking EQT Bask ADV that was inspired by various 90's Adidas basketball sneakers. Its upper features a blend of knit and suede overlays. Most of the users are praising the comfort it provides and ankle support. Basketball fans and casual buyers agreed that the construction and quality of the EQT Bask ADV are worth complimenting. Overall, the athleisure looks and comfort make it a viable choice for an everyday shoe. This Adidas pair can be purchased for the regular price of $120. From 7 to 14 in US sizing, men can get a pair of the Adidas EQT Bask ADV. Currently, the color options available are Grey / Grey / Sub Green and Core Black / Core Black / Core Black. Many fans still view the signature shoes of their favorite players as the best basketball sneakers despite the vast array of basketball-inspired footwear. Here are a few exceptional kicks that can be worn on and off the court. Selected as 1st overall by the Chicago Bulls in 2008 draft, a 19-year old Derrick Rose had a lot of expectations. Playing for the city he grew in, plus filling in the star void that the Bulls have, since Michael Jordan's departure in 1998. D-Rose proved he can handle the pressure and then some, cruising into winning the Rookie of the Year. During his rookie season, he helped the Bulls reach the playoffs and gave the defending champions the Boston Celtics all they can handle. By his 2nd season in the league, he is selected as an All-Star reserve. He is the first Bulls player that has been voted since Jordan. On this 3rd season, he put the league and the basketball world on notice. Perennial MVP candidate LeBron James and other players in the league all agreed that Rose should win the coveted Most Valuable Player award. Against all challenges, he went to be crowned as the youngest MVP in NBA history. Sadly after this successful season, various knee and ankle injuries robbed him of his potential. Recently, he showed a flash of his former self when he scored 50 points as a backup point guard for the Minnesota Timberwolves. Derrick Rose has a respectable sneaker line with Adidas. Here are some of his signature shoes that have received high remarks from wearers. The Oklahoma City Thunder had completed their rebuild phase in 2009 when it drafted James Harden. Looking back, many teams envied of how the team managed to draft three future superstars in just three years. Kevin Durant, Russell Westbrook, and James Harden was the core of the team and showed the NBA that they are for real. They competed for the NBA championship in 2012 while being regarded as one of the youngest teams. Harden was playing off the bench during his tenure with the Thunder and managed to win the Sixth Man of the Year Award in 2012. However, despite the team’s bright future, the Thunder wanted to avoid paying the luxury tax and decided to trade Harden. This business decision was widely scrutinized, up to this day. Harden blossomed as a superstar and MVP while playing for the Houston Rockets. People everywhere are wondering of what could have been if Durant, Westbrook, and Harden stayed together. Any NBA teams would do anything to have three legitimate MVP winners on one team, and the Thunder simply squandered it. James Harden was endorsing Nike but later transferred to Adidas. Here are a few of his signature sneakers. There was not much hype surrounding Damian Lillard when he decided to enter the 2012 NBA draft. He didn't represent popular schools like Duke or Kentucky, and he played for three years in college. Usually, teams are looking for "one-and-done" talents. Because of that, Lillard was drafted as the 6th overall by the Portland Trailblazers, behind players Michael Kidd-Gilchrist, Dion Waiters, and Thomas Robinson. By the end of the 2012-13, except for the New Orleans Pelicans and Washington Wizards, the teams that passed on him are all scratching their heads as Lillard managed to get Rookie of Year honors over future superstar Anthony Davis. Lillard provided consistent stats and durability during his young NBA career. He is always included in the MVP conversation and All-Star selections, making him one of the top point guards in the NBA. Hitting clutch shots has become his forte, and he continues to lead his team to the playoffs since 2014. Going by these accomplishments, it is safe to say that Lillard will have a successful career and potentially being included in the Hall of Fame when it’s all said and done. Ever since his rookie season, he is with Adidas. Here are some of his signature kicks. 1. What is the price range of Adidas basketball sneakers? Prices usually start from $60 to $200. For obvious reasons, signature basketball sneakers cost more than the standard ones. 2. Where to buy Adidas basketball-inspired sneakers? With hundreds of official Adidas outlets all over the world, there wouldn’t be an issue if one is searching for Adidas basketball shoes. Also, several major retailers, whether on the net or physical stores, are abundant of these shoes as well. 3. How do Adidas basketball sneakers fit? Many have attested that most of them provide a great fit, thanks to the materials and technologies utilized. 4. How to determine the model of your Adidas basketball footwear? It could be determined in numerous ways. There is usually a model number on the tongue or the side of the box if the shoe is already at hand. If browsing online, one can do a google reverse image search. Also, searching on the brand’s official site could be helpful in getting the name of the shoe. 5. Which is the most popular Adidas shoe that has basketball roots? By far, it is the Adidas Superstar. No other Adidas basketball shoe could match the versatility, timelessness, and enduring success of it. Its impact in pop culture is right up there with the Stan Smith and Gazelle. 6. What is the size range of Adidas basketball shoes? 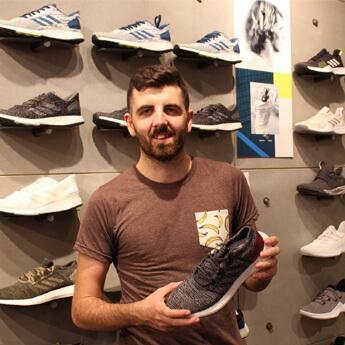 On average, sizes for men starts from 6 to 15. Women’s sizes are usually from 5 to 12. 7. Which materials are used as the upper for Adidas basketball sneakers? The most common is leather, authentic or synthetic. Primeknit is also a commonly used, due to its comfort, flexibility, and seamless fit. 8. What is the usual cut of Adidas basketball shoes? Since a significant percentage of the models offered are variations of the Superstar, low-cuts are abundant. Still, there are plenty of alternatives for those customers who prefer mid and high-cut shoes, such as the Adidas Hoops 2.0 Mid and Adidas Top Ten Hi. 9. Which Adidas basketball kicks are for women? While the Superstar is the most common answer, there are also other kicks that women will appreciate. Adidas Viral 2.0 and Adidas Cloudform Daily QT Mid are a few examples of Adidas women’s basketball sneakers. 10. Where are Adidas basketball sneakers being made? There are numerous countries all over the world that makes Adidas basketball sneakers. Vietnam, Taiwan, Turkey, and India just to name a few. The company essentially have its factories in every continent. Adidas has more than 300 factories in China alone.